Healthy Little Sleepers — Can My Baby Have a Night Feeding and Still Sleep Through The Night? … Yes, even this is too bright. But you do what you gotta do to get a good picture. I love when I get questions that I can share with you and you can benefit from the information too. The straight forward answer to this questions is “Yes”. You can work on nighttime sleeping and still have a nighttime feeding. ESPECIALLY if your pediatrician is recommending to keep it for weight. Just know that by 8 to 9 months night feedings are almost always not needed anymore… and for some babies, night feedings disappear a lot earlier, some as early as 3–4 months. The main consideration here is the concern of wanting to feed her because of weight gain. Always defer to your pediatrician if your little one is not gaining weight and s/he advises to keep a night feed. 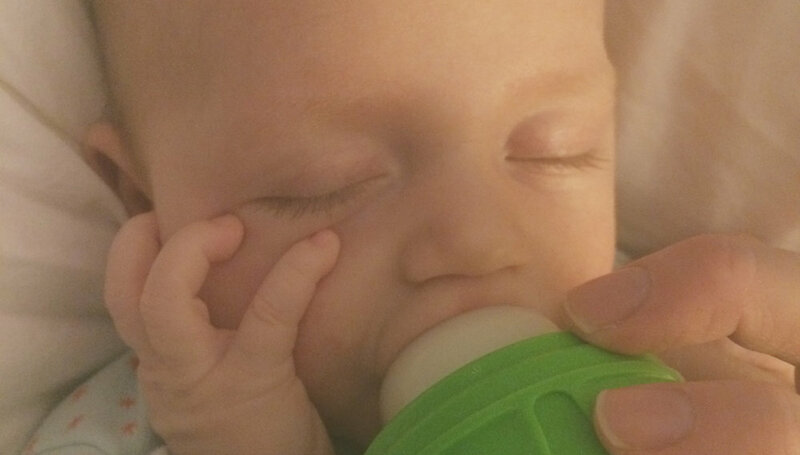 Keep Minimal Interaction… Go in to feed, little to no eye contact, light burp, and then back in crib. Keep the Lights Off… Turning on the light is actually disruptive to your baby’s sleep rhythm and can encourage engagement and all of a sudden your little wants to play. Diaper change?… Try to avoid it if you can. It ends up being more stimulating. If needed, try to change in the middle of the feeding. You want any first feeding of the night to occur after 12:00AM. This timing on the clock is in line with your little one’s first 4–5hr stretch of sleep from 7PM-12AM. The first 4–5 hour stretch of sleep during the night is non-REM sleep and is the deepest of sleep and most restorative for your little one. So during this time, we don’t want to interrupt sleep. Our bodies actually reset and flush out many of the toxins from our day — your brain actually shrinks during this time to help with this flushing process. As long as your little one is 4 months of age, her sleep rhythms (aka circadian rhythms) are developed which means her first stretch is this non-REM sleep, just like adults. When Cleared, How Do I Get Rid of the Nighttime Feed? There are many ways to go about this. Depending on what your ultimate goal is will determine how you approach this. Here are 3 very common approaches, and a combination of these can work great too. Slowly transfer nighttime feeding into daytime. The goal here is to move feedings of hunger out of nighttime and into daytime. You do this by gradually reducing the length (amount of time your are feeding) or amount (number of ounces in a bottle) of the nighttime feeding. So for example, if you are nursing, you can reduce the time you are nursing by 2 minutes every couple days. If your little one is used to nursing for 10–15minutes, in 5 to 7 days you will have transferred into daytime. You will probably see your little one take more ounces for the first two feedings of the day. The goal here is to push the feeding later and later in the night to the early morning until it disappears. The most gradual way to push a feeding is to move the feeding later by 15 minutes every other night or every three nights. But how? When your little does wake up at that specified time she is used to feeding, you can implement your behavioral method you are using or have used in the past to learn how to sleep. She may just fall back asleep. And if that’s the case, great! The next time she wakes up, you can go ahead and feed her — maybe it will even be closer to 3 or 4 am! And you’ll be moving in the right direction… pushing those feedings later! The goal here is to help your little one take the milk calories she needs during the day, and not at night. You will be replacing milk contents with water. She might be really upset about this idea and refuse the water all together. If you don’t feel like going cold turkey with all water, dilute the milk gradually. The tricky part with this option is that your little one may be sensitive to wanting to feel “full” for sleeping. So, she may still want the water and then you are still stuck with this water feeding now. If this is your case, combine this option with the first option of slowly transferring into daytime. That way reducing how much she is getting will also help. Whatever you do decide, the important part is consistency. Consistency will help with not sending mixed messages. If you need help figuring out the best way to drop a feeding or have some other sleep question or related challenge, go here to schedule a FREE 15-minute call with me, and we can chat about it! Yes... I want the best or my little!